Tucked away is a thoughtfully designed property where peace and comfort await. This landscaped setting is an acre of privacy with bucolic fields peppered with unique specimen trees. Mature and lush landscape flanking the stone walkway provide a warm welcome. 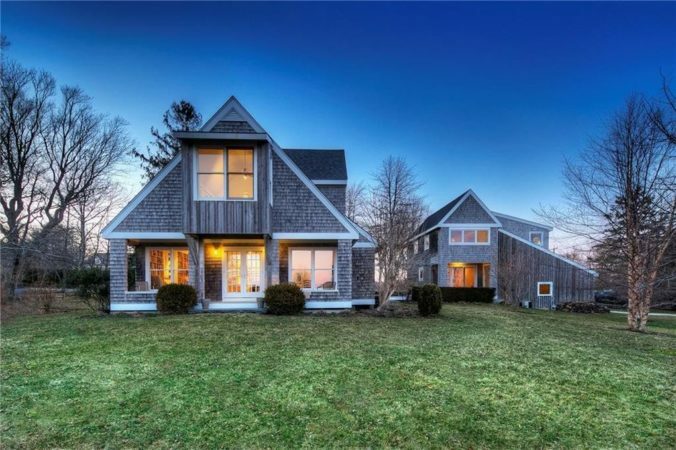 This fabulous shingled-style home is sun-drenched and offers a modern, sleek chef’s kitchen, fine craftsmanship, magnificent floor-to-ceiling windows and painted poplar floors. High contrast finishes feel crisp and fresh, uncluttered and composed creating calmness and ease for an otherwise busy life. The residence offers three en-suite bedrooms, and a separate outbuilding with a two-car garage. It is also home to a private office and/or recreation space. Close proximity to Saturday night polo matches, Aquidneck Land Trust trails and Sakonnet River.